'Give thanks in everything, for this is God's will for you in Christ Jesus.' (1 Thes. 5:18) Those are the words that spun through my head after I woke up feeling sick and miserable on Christmas morning. I have learned that God tends to teach me through my sickness, so, a little grudgingly (because who actually wants to be thankful for a cold), I gave Him thanks for my discomfort. I have been thinking in broader terms than usual this Christmas. Normally, I just like to think about Jesus, 'the Reason for the season', being born as a baby in a stable. But this year, my mind kept wandering on to His life of ministry, His death, and His resurrection and ascension...that whole lovely and terrible sequence of events that changed the course of human history. My mind is basically like a rock tumbler. I tumble a thought around and around inside my mind until the thought is polished and beautiful and I must decide what to do with it. Sometimes I share it with people. Sometimes I store it away for my own personal enjoyment...and sometimes I write a blog post about it. Until now, I have written nothing on the subject of the Sandy Hook mass murder. What could I say? Could my words contribute any positive or helpful light to such a dark situation? If I had been there, in that community, with the opportunity of speaking to the family and friends of the victims, what could I possibly have said? "Jesus loves you?" "I'm praying for you?" "It'll all be OK?" "I hate that murderer, and I'm sure he'll burn in hell?" (I would not even consider saying that). Such words, such inadequate words, would not pass my lips, and so they did not pass my fingers, either. Believe it or not, the mercy with cheerfulness thing is actually quite hard. Miss Calamity either tries to help too many people at the same time, becoming overwhelmed (and therefore grumpy), or is convinced that she's not helping enough people (and is therefore grumpy). In short, she spends more time being grumpy than she does practicing mercy with cheerfulness. Finding a balance is hard. I had to chuckle when I saw this on Facebook. Apparently, complaining about Monday has become the trendy thing to do. Or maybe it always has been, and I just never noticed it before. 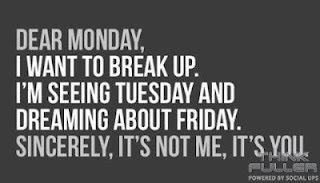 Whatever the case, I am glad that the Monday blues have not yet caught up with me. Even when I was a child, living in dread of the well-hated mathematics, I rather enjoyed Mondays. I like the feel of getting back into the well-worn routine of things. After two days of relaxation, it's good to have the solidity of a Monday to fall back upon. If I had a kingdom at my disposal, I think I'd be willing to work a swap right about now. In other words, a horsey person should never watch 'Hidalgo' unless they have a horse of their own to ride. 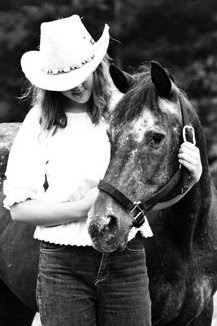 I have been horse-less for about a year and a half now, and it's beginning to tell on me.